At Rite Aid first thing you need (just like CVS) is a Plenti Points card. You can get a PP card in store or sign up online where they will mail you one. This is Rite Aids rewards card and how you will accumulate points which is Rite Aids rewards system. Such as spent buy 2 get 400 plenti points which is equivalent to $4. Be sure to create a Plenti account, there you can also take advantage of household offers which can be stacked with in store deals. Example, we go online and there is a $3 plenti offer when you spend $12 on dove but there is also an in store deal for $4 plenti when you spend $12. If you load the household offer to your card you will receive both offers. Limit is 1 per card for household offers unless otherwise noted. Rite Aid also has limits for plenti point offers just like CVS. Make sure to check the weekly ad or store tags to see what the limit for each offer is. Rite Aid accepts 4 identical coupons for the same number of qualifying items at the sole discretion of the store. At Rite you can also stack store coupons with manufacturer coupons. Some Rite Aid Store coupons are Rite Aid manufacturer coupons which appear in the weekly ad, on their website or are sent to customers via email. These coupons have a barcode that starts with “RC49”. There are also Rite Aid valuable coupons. We get these on rare occasions, a hidden gem! We have seen them printed on the bottom of receipts, in the weekly ad and most commonly found in peelie form. If you see bright green peels those are Rite Aid valuable coupon. These begin with “RC48”. This is a 3 way stack at Rite Aid which makes some great deals! Colgate mouthwash is on sale for $2.99, buy 1 get 200 plenti points. Net would be a $.50 money maker!!! Another thing to note is Plenti Points are always before coupons. Lets say a deal is Spend $12 get $4 plenti points. You only have to hit the $12 threshold before any coupons to still receive the Plenti Points. 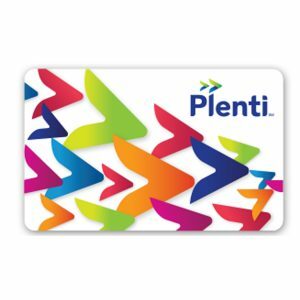 Yes, you can use plenti points from a previous transaction and still receive plenti points however new plenti points become available the following day after 6am.